Explore the Derwent Valley Heritage Walk at your own pace on a self-guided walking holiday. Accommodation, luggage transfer and custom holiday pack included. A walk through the Derbyshire Dales from Ladybower Reservoir in the north to Shardlow in the south. 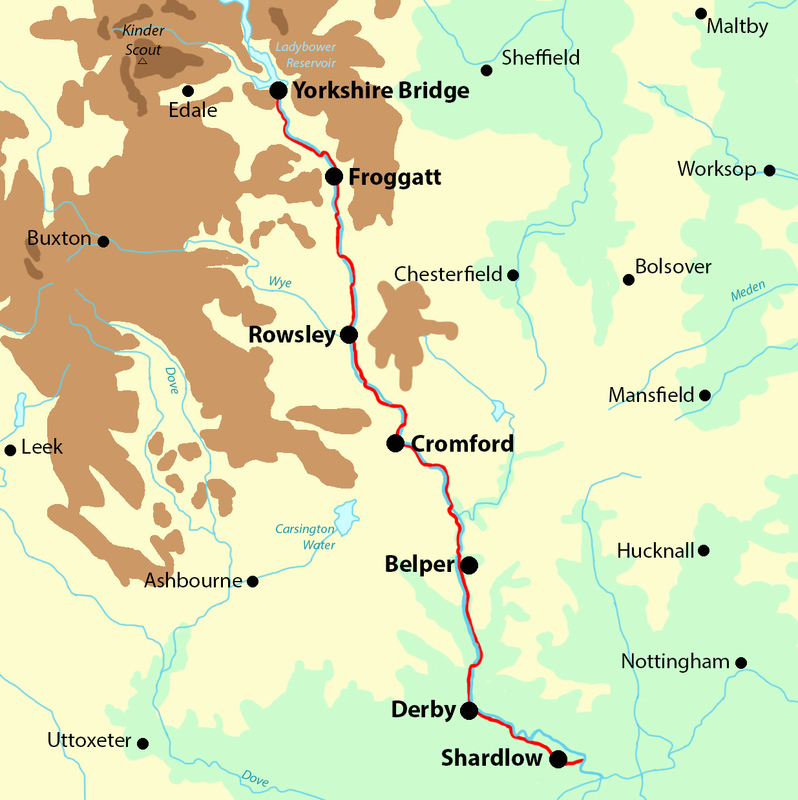 The Derwent Valley Heritage Way follows the Derbyshire River Derwent from Ladybower Reservoir to Shardlow, encountering a range of beautiful scenery and industrial heritage along the way. The trail enjoys wonderful views across the Derbyshire Dales and visits numerous sites of interest, including the Derwent Valley Mills World Heritage Site and a collection of museums, stately homes, wildlife reserves and even a steam railway. There is a variety of quaint villages and friendly towns along the route, as well as the thriving industrial city of Derby, boasting everything a walker could require. The trail itself is well-signposted with reasonably gentle terrain; however, there are a number of varied climbs with the reward of beautiful hilltop views to keep walkers engaged throughout. Starting the walk at Ladybower Reservoir, famous for being the testing ground for the Dambusters. Visiting the many charming towns and villages along the way, including the historic Matlock Bath, boasting a wide range of attractions. Learning about the wealth of local history around the area and how the River Derwent contributed to Derbyshire’s industrial development. The Derwent Valley Heritage Way passes through so many interesting locations that it's worth extending your holiday in order to take in more of the sights along the way. Should you wish to add some extra nights into your walking holiday, here are a few ideas to help you choose where to stay. Rowsley is an excellent choice for an extra night?s stay. Perched on the bank of the river Derwent, the village boasts plenty to entertain visitors, including a shopping complex, two small art galleries and a cosy pub, with other features of interest including pretty cottages, the marvellous St Katherine's Church and the well-preserved Victorian Caudwell?s Mill. Those wishing to explore the surrounding area will enjoy the range of walking trails which radiate out from the village, including paths leading to both Chatsworth and Haddon, were you will find the impressive buildings of Chatsworth House and Haddon Hall. The town of Belper is also rich in industrial history and has plenty to see and do, making it an excellent location for a rest day. There is a vast range of old landmarks to discover around the town, including Strutt's North Mill, Long Row and The Clusters, the Nail Makers Workshop and St John's Chapel, the oldest building in Belper. Other features of interest include the Belper River Gardens, usually filled with colourful flowers and special events ? the powerful 18th century Horseshoe Weir, the award-winning Ritz Cinema and an array of specialist shops and eateries, each boasting warm welcomes and fantastic local produce. By Air - The most convenient major city and international airports are Manchester, Birmingham and East Midlands. By Rail - The nearest station to the start of the trail (Yorkshire Bridge) is at Bamford (about 2 miles away). The nearest station to the end of the trail (Shardlow) are either Spondon (about 5.5 miles away) or Derby (about 6 miles away). By Bus - Various bus services run to Yorkshire Bridge and from Shardlow. From London - Trains run from London St Pancras International and London Euston stations to Bamford. From there a bus/taxi will be required to Yorkshire Bridge. Return To The Start - The easiest way to return to the start of the trail, is to take a bus/taxi from Shardlow to Derby rail station. From there trains run to Sheffield, where a bus/taxi will be required to Yorkshire Bridge.